As far as technology goes, I'm a fairly loyal customer. In life and business, if I find a reliable partner, I stick with them. I'm a one-woman kind of guy. Not so much a fanboi as man who trusts the name of someone who has been good to me. Google, Samsung, Nintendo, Nikon. I have given a LOT of money to these multinational corporations and their related partners. Sometimes after much research, sometimes on a whim and rarely disappointed. 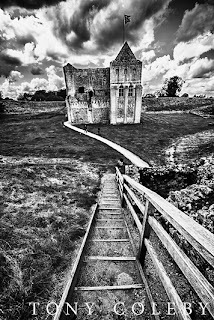 In the case of Google and Nikon, the money I give is from my business and is an investment in services and equipment, vitally important to enable me to earn money, to eat, pay bills and yes, ultimately spend more money. It works. Google's Nexus 7 appeared, without a definite launch date and took the tablet sector by storm. Until this year I had ummed and ahhed about buying a tablet device, weighing up the price versus the benefits. There's no way I could justifiy an iPad and those kind of prices and besides, I'm not at ease with the whole Apple thing. This isn't about that though. Mostly, I didn't like the 10" form factor. The Nexus 7 was perfect for my small hands and great for showing customers decent sized images (1200x800), for a price I liked: £199. Had it not been a Google product, technically-speaking, I would have not actually bought a tablet just yet. In fact, perhaps never. But I've come to love Android, and hey, I know Google. You know Google. Everybody knows Google. The whole "Do no evil" thing may have been brought into question in recent years but they make stuff that "just works". I was lucky enough to grab one of the first Nexus 7s to these shores (I'm in the UK) and I was bowled over by its size and its power. Within seconds of the purchase, the device was alreading syncing my email, my data and even my installed apps from my Samsung Galaxy S. I was off and browsing long before I got it home. This is what new tech should be all about. I noticed the next day that the micro USB port was very fussy. At one point it wasn't charging so I tried my Samsung charger and despite being a lower amperage (.7mA compared to 2A) it worked, albeit slowly. Then it stopped. Then it started. I discovered that the USB charging cable actually had to be pulled down a little until the charging icon appeared. Hmm. awkward, annoying, but not worth returning it for. Besides, no store within 100 miles had a replacement - the Nexus 7 had sold out predictably enough. After reading on the net how common this problem was, I learned to live with it and learned to love the Nexus 7 even more. It was perfect. It was my new favourite device and my desktop PC, my laptop and even my phone were all seeing less action since its arrival. I guess that's what they call a fusion device. Work, browsing, gaming, video, music, it was spot on for all of these tasks. The 21 day return period came and went (I'd bought it from PC World). 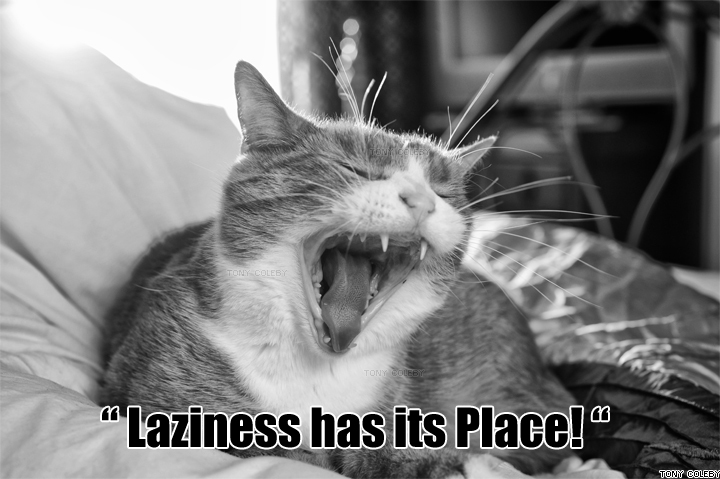 A few days later an odd problem reared its head: the Chrome browser kept launching itself. Uh-oh. One power cycle later and phew: no more weird browser launches. It happened once more, a couple of weeks later. Again a power cycle sorted it out. By this time, the micro USB socket was VERY finicky. The angle that the charging cable had to be at to actually charge was extreme. This had no doubt weakened the end of the cable, in fact it wobbled visibly. I had to buy a replacement but not before I'd tried to fix it myself: I'd read how finicky others' Nexus 7s were about which brand of cable was used to charge the device. I removed the plastic cover with the hope of reinforcing it with some cardboard, to give it extra purchase when plugged in. No go. This was a last gasp attempt to solve the lesser of the my two (eventual) problems. Not worth returning the unit for in itself. The touchscreen was being 'activated' at the exact spot where the second icon on the home screen sits: usually the Chrome browser icon. It was still doing it. A LOT. So I did a factory reset. Surely this will take care of it I thought. Yeah, for about 5 minutes. Then it was, "Click. Click. Click-click. Click-click-click-click-click-click-click-click-click." To do anything on the tablet I had to hold the spot where the phantom touches were occurring, while performing the thing I actually wanted to do. Thanks due to multi-touch. I reset the device to defaults AGAIN. All to no avail. Now, I was long over the 21 day return period but in the 2 months I'd had the device, I'd used it a lot. I'd taken fairly good care of it too. Apart from a few nicks here and there, similar to the kind of wear and tear that a phone receives, the Nexus 7 was in pretty good condition. I even bought one of those ugly soft cases for it. And used it. PCW: "Asus said you damaged the touch-screen. There are marks on the screen which is evidence that you damaged it." PCW: "Yeah, anyway, they want £189 to repair it..."
Asus are telling me that these two missing flakes of paint are affecting the touch-screen three inches away. I have obviously taken issue with Asus about this, as of 15:15 on Day 1, I have yet to receive a reply. I'm no national tech journalist, I don't have thousands of people asking me for my opinions and recommendations on what to buy. It's simply dozens. At least once a month someone I know buys something on my say-so. I am a Nikon evangelist, any of my students are told why this is and I can demonstrate it. Similarly, the Google name means a lot to me. But right now there is a big brown smear over that multi-coloured logo. And Asus put it there. 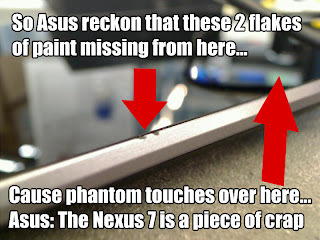 Asus: we both know that you released the 'Google' Nexus 7 with flaws which were not quite ironed out yet. You have no doubt been inundated with returns and are attempting to minimise money and time spent on repairs and replacements. I will NOT be swept under the carpet. I want YOUR flaw repaired, or my Nexus 7 replaced. I will take this as far as it needs to go and THEN SOME. 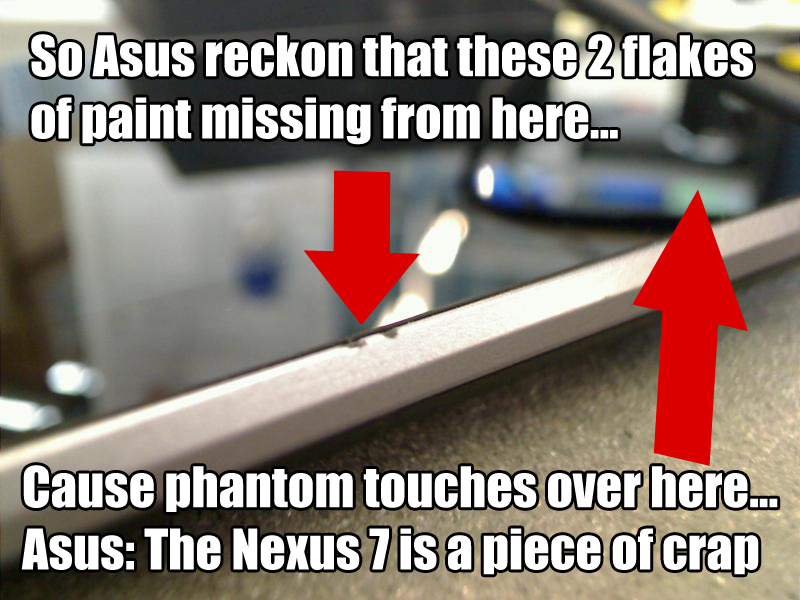 In the meantime folks, be quite careful before you spend on money on Asus products, especially the 'Google' Nexus 7. Update: One week on and I squeezed a reply from Asus, not from their service centre, not from PC World, I had to make a complaint on an obscure website which I only found by Googling. No explanation other than "This is still a chargeable repair. Complain to ASUS UK if you don't like it." Only a street address given.